Three-and-a-half years ago, four months after the Tories won the 2015 general election, Jeremy Corbyn swept into the Labour leadership with a landslide victory. For many of those facing the prospect of five years of brutal Tory austerity, his election raised their hopes that perhaps an effective political weapon to defend the interests of the working-class majority was being forged. At the time, we described Labour ‘as two parties in one’: a potential mass anti-austerity party in formation around Corbyn, on the one hand, and a pro-capitalist party which dominated the Parliamentary Labour Party, Labour councils and the party machinery, on the other. What is the situation today? Jeremy Corbyn remains leader but the pro-capitalist wing also remains. What are the prospects for Labour becoming that effective political weapon? Has the time come for the working class to search for other roads to political representation rather than struggling to transform the Corbyn-led Labour Party? What balance sheet can be drawn of the last three years that points the way forward for the coming, undoubtedly tumultuous, period ahead? When Corbyn was elected he inherited a Labour Party structure that had seen all the elements of workers’ democracy stripped out over the previous decades, as the pro-capitalist Blairites consolidated their grip on power. Even the rule change that allowed Corbyn to be elected – where registered supporters could vote for £3 – was originally introduced as part of the Collins Review, designed to complete the process of removing trade union influence within the party. So far little has changed in the party’s structure since Corbyn’s election. Mandatory reselection of MPs has not been introduced. At last year’s Labour Party conference the level of support needed to initiate the ‘trigger ballot’ process, which can result in MP reselection contests, was lowered, from needing half of local Labour Party branches to vote to trigger one, to only a third. No other significant rule changes have been made, however. This does not mean that nothing has changed. Jennie Formby becoming Labour Party general secretary clearly strengthens the position of Corbyn supporters within the Labour machine. The left now has, at least nominally, a slim majority on the national executive committee (NEC). However, the failure to carry out major democratic reforms is not secondary. It reflects the left Labour leadership’s conception that it should avoid breaking with the open representatives of capitalism within the Labour Party in order to maintain ‘party unity’, rather than acting to transform it into a party of the working class. This has resulted, for example, in the leader’s office intervening to try and convince the Enfield North and Wavertree constituency Labour parties not to move votes of no confidence in their MPs – both of whom have since left to join the renegade ‘Independent Group’ (TIG). The Labour NEC has to fire the starting gun on the trigger ballot process before local Labour branches can start campaigning for the opportunity to deselect their right-wing MPs. Despite the clear possibility of a general election, it has yet to do so, although it is reported to be planning to discuss the issue this month. This was probably a trigger for TIG MPs acting when they did. It would be a serious mistake, however, if Corbyn supporters on the NEC now retreat from starting the trigger ballot process under the impact of the TIG resignations. But even if the first steps are taken this month, if, as is possible, the Tory government collapses in the coming weeks, it will largely be the existing Parliamentary Labour Party that contests the general election. Meanwhile, the right wing inside the Labour Party has used TIG as a stick with which to beat Jeremy Corbyn. Deputy Labour leader Tom Watson has criticised TIG only for being ‘premature’, and has now launched the ‘Future Britain’ grouping within the Labour Party which consciously echoes the language and politics of TIG. More than 90 MPs attended its inaugural meeting, including members of Labour’s front bench. Its supporters accurately describe this as a ‘party within a party’, preparing to block any radical moves by a Corbyn-led government. Anyone who is prepared to face reality can see that attempting to appease and compromise with the Future Britain group and their ilk will only give them more confidence to step up their attacks on the Labour leadership. Nothing short of a complete and utter capitulation to pro-capitalist policies would satisfy them. Yet, in the face of the campaign to demand the suspension of Chris Williamson, the left Labour MP for Derby North – in a common front with the right-wing press and Theresa May, who used prime ministers’ questions in parliament to make the same demand – the Labour leadership capitulated in the space of a few hours. Chris Williamson has been suspended on the entirely spurious grounds that the remarks he has been reported to have made at a Momentum meeting were anti-Semitic. The excuse for attacking Williamson was a speech in which he rightly said that Labour’s response to accusations of antisemitism has been "too apologetic". In the same speech he referred to antisemitism as a "scourge", making it clear that he in no way defends it – his argument was that the Labour Party does counter it and is not a racist party. Jennie Formby has reported that, over the last ten months, 453 party members have been investigated for antisemitism, which is less than a tenth of 1% of the membership. These were investigations rather than members judged as guilty. Williamson’s suspension is a serious retreat which, if he is not reinstated, could mark a turning point in the civil war that has been fought in the Labour Party since Corbyn’s election. The right scent blood and are stepping up their offensive. Shamefully, many of those who have claimed the mantle of ‘left’ advisors to Jeremy Corbyn immediately weighed in to support the suspension, including Owen Jones and Novara Media’s Ash Sarkar. Jon Lansman, supposedly leader of an organisation set up to defend Corbyn and the left – Momentum – even tacitly encouraged the suspension before it took place, saying that it was only a matter of time before Williamson "does something which results in a complaint being made which will then have to be investigated". This puts the final death knell in the long-since discredited idea that Momentum represents the most militant and determined elements on the Labour left. On the contrary, the national leadership of Momentum is consistently on the right flank of Corbyn supporters. It sees its role as to emphasise the need to be ‘reasonable’, that is, to compromise with the right. This has been its trajectory since it took the decision to try and act to police the left rather than build it, limiting its meetings only to those who had been allowed into the Labour Party. Central to this was Momentum’s desire to exclude our members, as even its Wikipedia entry confirms, stating that the banning of non-Labour Party members from participating "was intended to restrict the influence of the Socialist Party and others". In the event of a snap election being called, Momentum might well, as in 2017, act as a means to organise campaigning for Labour candidates. It may also gain some traction for the campaign to force by-elections in TIG MPs’ seats. Nonetheless, any claim Momentum had to being a force that is fighting to transform the Labour Party is now discredited. More broadly, even prior to the suspension of Williamson, there had been a significant ebbing of enthusiasm for Corbyn among the hundreds of thousands of trade unionists and young people who were initially galvanised by his election. Corbyn has seemed like an absent figure, rarely heard over the babble of Tory divisions on Brexit and the pro-capitalist views of the majority of the Parliamentary Labour Party. After his election, Labour Party membership surged to 552,000 making it, on paper, the largest political party in western Europe. Today, Labour Party membership is reported to have dipped to 512,000, although that is still around double the size of Labour’s membership prior to Corbyn becoming leader. However, many of those who joined the party on the back of his election never became active in their local Labour parties – or only very briefly – having been put off by their right-wing character and the absence of any clear call to fight to transform the party. For those who have continued to actively support Corbyn in the Labour Party, the news that the leader’s office gave in under pressure and suspended Williamson is bound to have a demoralising effect. In the early days of Jeremy Corbyn’s leadership the idea, peddled by the Momentum leadership and others, was that Podemos-style ‘horizontalism’ was the way to harness the hundreds of thousands who were enthused by Corbyn to push Labour towards the left. Meanwhile, the trade unions were discounted or even dismissed by some as bulwarks of the right. Undoubtedly, the many individuals who joined Labour to back Corbyn had the potential, if organised collectively, to play a key role in the transformation of Labour into a workers’ party. This could never have been done by putting central the supposedly horizontal methods of online polling favoured by the Momentum leadership. When Momentum carried out a poll in 2018 for what programme to put forward to democratise the Labour Party only 3,500 participated. This reflected much more than reliance on online polling. More fundamentally, it reflected the very weak proposals being put forward and the Momentum leadership’s complete opposition to organising a mass, democratic movement in support of Corbyn, with a programme to drive the Blairites out of the party. As a result, the layer swept up in support of Corbyn appears to have largely evaporated, at this stage. In the main, this is because of the failure to give them a fighting lead, but it also in part reflects the layers of society who were drawn into activity by Corbyn. They are of a mixed character, including a large layer of the radicalised middle class. Wide sections of the middle class, especially among the young, are being radicalised by the failure of capitalism to offer them a future that matches their expectations, and are increasingly adopting working-class methods of struggle. This is a very important section of society, many of whom can be won to a Marxist programme in the future. Nonetheless, they do not yet have a fully working-class outlook. If joining the Labour Party meant becoming active in a workers’ party, where the organised working class set the tone, it would be part of completing the process of winning them to a working-class standpoint, but this has not been the case. 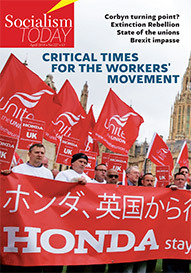 Nonetheless, the trade unions – extremely truncated as their democratic rights are within the Labour Party – have played a role, both positive and negative, in the Labour civil war. In standing up to the right, Jeremy Corbyn has relied particularly on the support of Len McCluskey, general secretary of Unite, Labour’s biggest affiliate. As a result of a motion moved by a Socialist Party member, Unite supports mandatory reselection of MPs. The leadership of the union, however, has not fought for the implementation of this policy nor has it, as yet, made any statement on the suspension of Chris Williamson. Nonetheless, partly as a result of our influence but also the pressure from below, McCluskey has put a clearer position on the role of the Blairites and on Brexit than other figures. On the other side, of course, right-wing union leaders are consistently attempting to undermine Corbyn. Dave Prentis, general secretary of Unison, for example, responded to the TIG renegades by disgracefully saying that "Labour’s overriding concern must be to look long and hard at the reasons why the MPs feel they are no longer able to stay in the party". Even the likes of Prentis, however, are not able to behave completely as they would like to – if free from the pressure of their membership. Unison, for example, formally backed Corbyn in the last leadership contest, despite Prentis’s undoubted reluctance, because Unison members would not have accepted any other position. A key part of transforming the Labour Party into a workers’ party would be to fully restore trade union rights within the party, but under the democratic control of union members. It would be part of returning the Labour Party to a modern version of its founding federal structures, which would also include allowing the Socialist Party and others to affiliate. This would enable all socialist and working-class forces to come together to build a powerful working-class party. Among the much wider sections of the working class and young people who were enthused by Jeremy Corbyn’s programme in the snap election of 2017 there is a strong feeling that he does not ‘have what it takes’ to fight in their interests. After all, why would working-class people believe that a Labour leadership is capable of fighting for them against all the power of the capitalist class when it is so patently incapable of effectively standing up to the pro-capitalist MPs and councillors in its own party? On Brexit, the millions of workers who voted to leave do not see Corbyn as fighting for a socialist Brexit in the interests of the working class. Of course, had Corbyn stuck to his own historical position in the referendum – and argued for a leave vote in opposition to the EU’s neoliberal, anti-working-class rules – the whole political situation would be entirely different. Instead, he succumbed to pressure to campaign for remain – albeit unenthusiastically – allowing the right-wing nationalists of UKIP and the Tories to put themselves at the head of the working-class revolt that the Brexit vote represented. Notwithstanding this Corbyn has, up until now, largely resisted demands from the Blairites that he should campaign for a ‘people’s vote’ (a second referendum) to reverse Brexit – rightly arguing that a real people’s vote would be a general election. Nonetheless, there is a danger that he could be seen as being responsible for ‘betraying Brexit’ among important sections of working-class voters. If this is the case, however, it will not primarily be because of his parliamentary manoeuvres but his failure – on this as on every issue – to go beyond parliament and launch a mass struggle, together with the trade unions, for a general election and the coming to power of a Corbyn-led government on a socialist programme. Such a programme could use the 2017 manifesto as a starting point but would also need to include, for example, reversing all cuts to council services, scrapping universal credit, and pledging to nationalise Honda’s Swindon plant under democratic working-class control, along with any other companies that carry out closures and job cuts in the name of Brexit. This should be combined with the nationalisation of the major corporations and banks to take the levers of power out of the hands of the capitalists who would inevitably attempt to sabotage a Corbyn government. This could be linked with a manifesto for a socialist Brexit, demanding that negotiations with the EU are reopened, with the ‘red-lines’ being opposition to all neoliberal pro-capitalist rules. On this basis, Corbyn would be able to enthuse the working class in Britain – both those who voted leave and remain – and make a very effective call for international solidarity with workers across Europe. Jeremy Corbyn’s failure to adopt a combative approach and the growing confidence of Labour’s pro-capitalist wing are serious danger signals for the future. Nonetheless, it would be premature to conclude that the ‘Corbyn project’ is finished and that the left has lost the civil war within Labour. On the contrary, Corbyn could be prime minister within months if not weeks. The ongoing Brexit meltdown could force the calling of a general election at any time. In other circumstances, the dire state of the Tory party would have led the capitalist class to turn to a Labour government to act in their interests, but Corbyn’s leadership means they cannot trust a Labour government to do so. This has acted as a certain glue holding the rapidly disintegrating Tory party together. Tory Brexiteer, Esther May, for example, justified her switch to supporting Theresa May’s deal by the fear of, "the Marxist frontbench opposite. Growing up in Liverpool with Militant and Marxism I know this is the type of chaos they want". However, the urge to unify in order to block a Corbyn government seems very unlikely to be sufficient to prevent the collapse of the Tory government for much longer. Potentially, Corbyn could then win a general election by a landslide. The doubts and hesitations that have developed about his leadership over the last months could be pushed to one side if workers saw the possibility of a government coming to power which would act in their interests. In the 2017 snap election, Labour increased its vote by 3.5 million, the biggest increase for any party since 1945. It is estimated that a million UKIP voters switched to Labour. This could be repeated on a bigger scale in 2019. However, this is far from guaranteed. If Corbyn allows the Future Britain group to influence the manifesto and the approach to Brexit, Labour could go down to defeat despite the Tory party’s profound crisis. The workers’ movement has to prepare for the challenges of a Corbyn-led government. It would come to power against a background of capitalist economic crisis and dislocation. And, even if Labour was to win by a landslide, as things stand it would be a kind of coalition government of the Corbynistas and the Future Britain group, whose role would be to act as agents of the capitalist class and prevent any radical measures in the interests of the working class. The strategy so far adopted by Jeremy Corbyn and John McDonnell – attempting to mollify the capitalist class and its representatives in the Labour Party – would lead to the betrayal of the interests of the working-class majority. However, we should not underestimate the enormous enthusiasm – after a decade of Tory rule – that would be engendered by the election of a Corbyn-led government and could be mobilised to oppose the capitalist saboteurs. It is urgent that the workers’ movement acts. As a first step, the Socialist Party calls for the convening of a labour movement conference to draw together all socialist fighters, trade unionists and anti-cuts activists to draw up an action plan to fight for the transformation of the Labour Party into a workers’ party, politically armed with a socialist programme.